Brahma is the source, the seed and the creator of all beings in this world. He is also the revealers of sacred knowledge including the Vedas. At the time of creation, he emerged as the first differentiated consciousness (the first ego) from the primal waters (universal consciousness). He is called svayambhu because in reality none created him. As Isvara, he created himself. Brahma originated from Manifested Brahman, just as everyone else, including Vishnu and Siva in the beginning of creation. Brahmam means the Supreme Spirit. Brahman refers to the Universal Self. Brāhmana refers to a person of priestly caste. Traditionally the Vedic priests are called brahmanas because they worship Brahman through the sacrificial ceremonies and ritual worship and invoke the power of Brahman. Brahmana also refers to the ritual portion of the Veda, which may often contain the spiritual wisdom of the Upanishads also. Brahma is occasionally used as an adjective in a superlative sense to mean very big, large, gigantic, etc. For example, brahmanada which means the cosmic egg or the universe itself. Brahma personifies brahmatvam or the state of union or oneness with Brahman. Although, Brahma is described as the creator god (srishti karta), he is not the primary creator or the source of all. Rather he himself manifests at the beginning of each cycle of creation from Isvara or the Manifested Brahman, who is considered the primary creator of all. 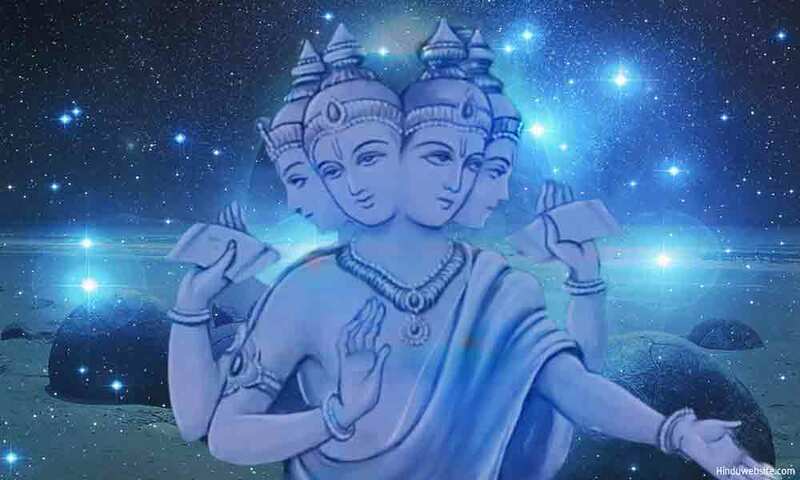 Brahma, therefore, is considered one of the Triple Gods (Trimurthis), the other two being Shiva and Vishnu. Each day of Brahma constitutes one cycle of creation (Kalpa) and his duration is said to be 100 years in Brahma time. Some Puranas suggest that there may be hundreds of Brahmas in a multiverse. He has many other names such as Hiranyagarbha (the cosmic germ), Viraj, Prajapati (the lord of people), Pitamaha (the father of fathers), Vidhi (the ordainer), lokesa (ruler of the world), dhatr (sustainer), and Visvakarma (architect of the universe). Followers of Vaishnavism depict him as nabhija or the one who was born from the lotus flower that sprung from the navel of Vishnu. This is however a post Vedic development. According to the Vedic descriptions, Brahma is the first form that emerges from Isvara in the beginning of creation, with specific nature, aspects and functions. Manusmriti states that when the universe was enveloped in darkness, Isvara himself manifested first as a golden egg and later as Brahma to dispel the gloom and the darkness. He divided the egg into earth and heaven and created from his mind ten Prajapatis (lords of the beings). Hence, they are also known as mind-born sons of Brahma. According to a second version, Brahma sprang from the sky (akasa), which may be a reference to pure consciousness. From him manifested Marichi, whose son was Kashyapa. Vaivasvata and Manu were his son and grandson respectively. Manu was the progenitor of all humans. Thus, going by to this version, Brahma is not the father of the human race, but the great grandfather. In another version, Brahma said to have born as Viraj from the male and female parts of the golden egg and from him Manu manifested. Brahma is compared to the Macrocosm or Nature in some Upanishads. He is Purusha, the Cosmic Being, who is mentioned in the Purusha Sukta of the Rigveda, according to which he created the world and beings out of himself by performing a self-sacrifice. That sacrifice is the model and the source of inspiration for all other Vedic sacrifices. In some Upanishads, he is also depicted as the immortal Lord of the Heaven, who receives liberated souls at the end of their journey along the northern path (uttarayana). It also appears that Prajapati was originally worshipped by Kshatriyas as their highest god and when the original Kshatriyas clans of the Vedic period declined, he was replaced by other popular gods. Brahma is the father of gods, demons and humans. According to the Upanishads, he taught them the Vedas and the importance of Virtue. Both Indra, the leader of gods and Vairocana, the leader of demons, spent considerable time with him to acquire the knowledge of Atman. While Vairocana failed to grasp the essential knowledge, Indra succeeded. He also taught three important virtues to his three classes of children, staring with the syllable, 'da.' To the gods he taught dama or restraint since they seek pleasure in all things. To the demons, he taught daya or kindness since they are cruel by nature and need compassion to balance themselves, and to the humans he taught dana or charity since humans are vulnerable to greed and selfishness and by giving charity they can overcome them. He also taught several Upanishads to the seers and sages. Compared to Vishnu and Siva, Brahma has never been popular in Hindu pantheon since post Vedic times, although in name and functions he is closest to Brahman. Although he was the highest god in the early Vedic pantheon, next only to Brahman or Isvara, and revered in the scriptures, we do not find the evidence of any sect, school or teacher tradition which exclusively worshipped him as the highest god. Further, going by the number of hymns addressed to him in the Vedas, he did not seem to be as popular as even Indra or Agni, who are traditionally invoked in most Vedic rituals and to whom most of the hymns in the Vedas are addressed. By virtue of his functions, Brahma seems unapproachable by the mortals, because his duty of creation demands introversion, complete concentration and undivided attention. Therefore, as a personal God he does not have much of an appeal. The Brahmanaspati and Brihaspati of the Vedas and the Brahma of the Hindu Trinity are said to be the same god. He is also the Purusha of the early Rigvedic hymns, the product of sacrifice, from whom emerge the worlds, the beings and the social order. In his book, the Secret of the Veda, Sri Aurobindo describes the connection among Brahmanaspahi, Brihaspati and Brahma in the following words. "Brihaspati, Brahmanaspati and Brahma are the three names of the god to whom the Rishi Vamadeva addresses the mystic hymn of praise.1 In the later Puranic theogonies Brihaspati and Brahma have long become separate deities. Brahma is the Creator, one of the Three who form the great Puranic Trinity; Brihaspati is a figure of no great importance, teacher of the gods and incidentally guardian of the planet Jupiter; Brahmanaspati, the middle term which once linked the two, has disappeared. To restore the physiognomy of the Vedic deity we have to reunite what has been disjoined and correct the values of the two separated terms in the light of the original Vedic conception." Brahma gradually lost his importance in the Hindu pantheon and yielded ground to the other two gods, Siva and Vishnu, in the Hindu Trinity. The title of Narayana (the creator of men) was originally ascribed to Brahma, but later to Vishnu. Similarly, the incarnations of fish, tortoise and boar were originally attributed to Brahma and later to Vishnu. One possible reason for these developments seems to be the growing popularity of Vaishnavism and Saivism coupled with the division of functions in the development of the concept of Trinity in which Vishnu alone as the sustainer of the worlds would incarnate. Brahma is known as Kanja or water born and Hiranyagarbha or the universal germ, because in the beginning of creation, he was born out of the golden egg that emerged out of the primal waters. Having manifested himself, he created Vac (speech or sound), also called Saraswathi. The goddess was so beautiful and gracious that he decided to make her his consort. The beings of this world said to have emanated from their union. Symbolically, Brahma and Saraswathi signify many things. Brahma is the creative will, and Saraswathi is the intelligence (buddhi) that executes the will of Brahma. Together they constitute the human consciousness. Secondly, Brahma is the Vedas personified and Saraswathi is the vibration hidden in the mantras as the sound (Vac). Together they constitute the spiritual knowledge of the Vedas. Thirdly, Brahma creates life while Saraswathi creates society and civilization and refines the individuals with civility and grace. Fourthly, Brahma is the primeval silence of soul, and Saraswathi is the noise (Vac) of life. Together they create the mortal beings. Fifthly, Saraswathi is the pearl of wisdom (sara) born in the shell of Brahma from a rain drop (svathi). Brahma is not only a creator, but also a great spiritual teacher. Many Vedic seers were his mind born children, who later composed the Vedas and taught the Upanishads to serious students. According to Manusmriti, Brahma created eleven Prajapathis who are believed to be fathers of human race. They are Atri, Angiras, Pulastya, Pulaha, Kratu, Vashista, Prachetas or Daksha, Bhrigu and Narada. He also created the seven sages or the saptarishis. Prajapathi Brahma is a familiar name that we find in the Upanishads, whom even gods like Indra approached and revered for Self knowledge. 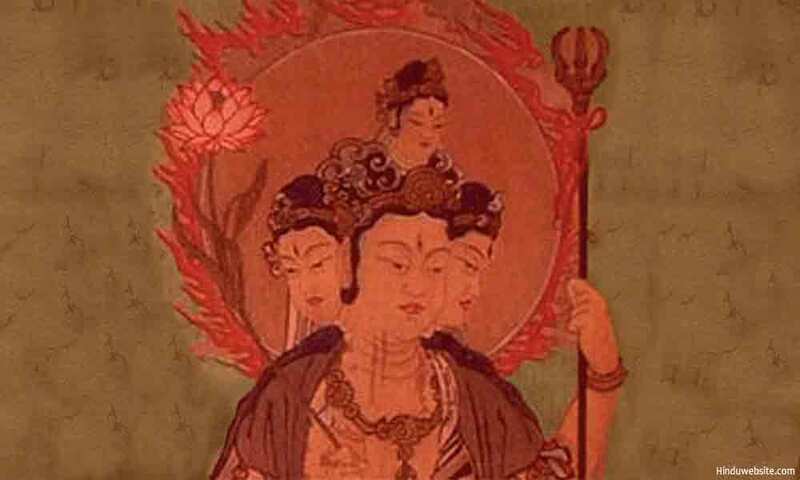 In the images Brahma appears like an old man, with four bearded faces, that look in four directions. The beard on each face alludes to his old age and wisdom. He is shown in a meditative mood, lost in his thoughts, with eyes half closed, suggestive of his spiritual bent of mind and his preoccupation with the process of creation. His four faces symbolically represent, the four directions, the four Vedas, the four Maha Yugas and the fourfold social order. 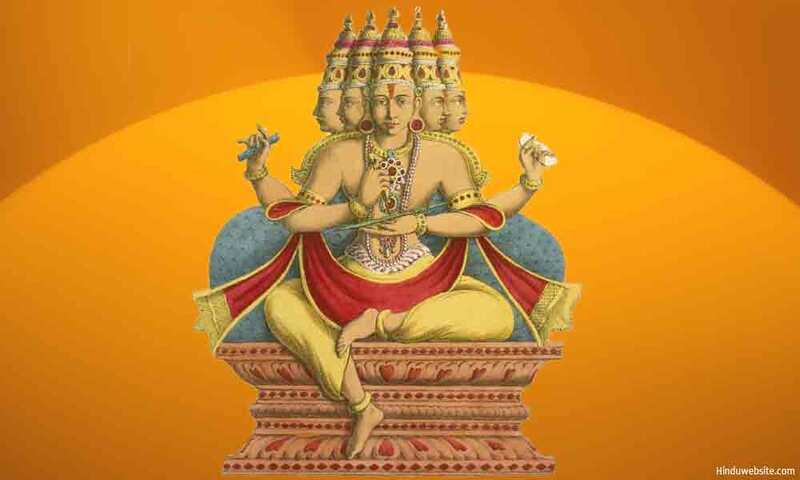 According to the Puranic stories originally Brahma had five heads of which one was cut off by Siva out of anger when the latter lied to him about one of his achievements. Obviously the story is meant to describe the supremacy of Siva over Brahma just as the followers of Vishnu describe Brahma as having been born from the navel of Vishnu. In his icons and images, Brahma is generally shown as having four arms, holding aksamala (rosary), kusaa grass, ladle, spoon, kamandala (a water pot), and a leafy manuscript respectively. Symbolically, the rosary indicates his creative nature. The kusaa grass, the ladle and the spoon indicate his familiarity with the Vedic rituals. The kamandala denotes his meditative and spiritual qualities. The vehicle of Brahma is swan, a beautiful and graceful bird, which symbolically represents the Buddhi or the discriminating intelligence, which is responsible for our discretionary and decision-making abilities. In some images he is shown as riding not one but seven swans. In this regard he reminds us of Varuna, the Indo Iranian Aryan god who is the upholder of laws, the knower of all, the seer, who travels across the heavens seated on a chariot drawn by the seven swans. However, there seems to be no connection between the two gods, other than that they were both worshipped by the Vedic people. Brahma is found in almost all the temples of Vishnu and Siva as an attendant god, receiving his daily share of offerings. However, we come across very few temples which are exclusively built for him and worship. Of the few temples that are dedicated to him, only two are mostly popular. One is the temple at Pushkar near Ajmer in Rajasthan, which is said to be about 2000 years old and the other is at Khedbrahma, near Idar in Sabarkantha district of Gujarat which was said to have been built in 12th Century or so. Brahma is also revered in Buddhism, not as a creator god (since Buddhism does not believe in the divine cause of creation) but as the king of the heaven of rebirth (brahma-loka) and the protector of the Buddhist Dharma. He is also given other names such as Baka Brahma, Mahabrahma, and Brahma Sahampati. According to Buddhist tradition, after his enlightenment it was at the urging of Brahma that the Buddha decided to spread his teachings in the world. 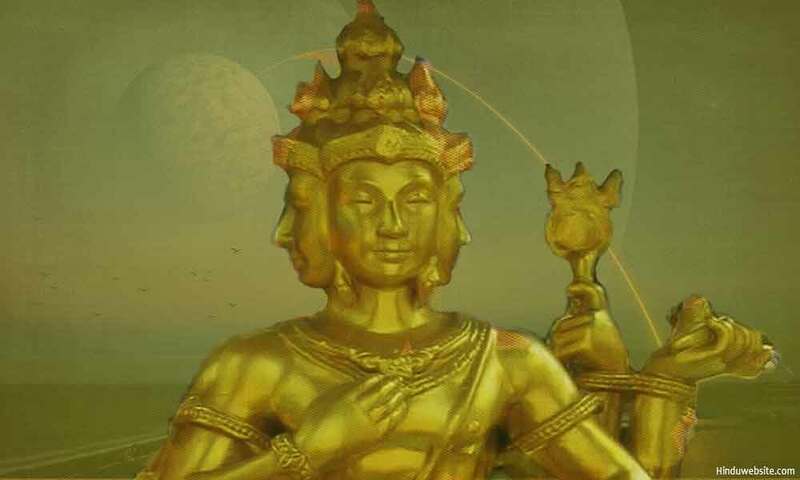 In the Buddhist tradition also, Brahma is depicted with four heads. In Buddhism, Brahma is also associated with four meditative states, collective referred to as Brahmavihara, which arise from the four meditative practices which involve meditation on forms or objects (rupa dhyana). Brahmavarchas : The effulgence of Brahma. The brightness in the face. Brahmacharya: The practice of celibacy. Brahmaarpanam: The offering of the sacred knowledge of the Vedas. Brahmastram: A powerful and destructive missile that has the power of Brahma. Brahmasanam: A specific yoga posture. Brahmahuti: An offering of sacred prayers from the Vedas. Brahmopadesam: An instruction in the Vedas. Brahmarishi: A rishi of great wisdom, especially of the Brahmanical genealogy. Brahmarakshasi: The ghost of a Brahmana. Brahmaputra: The name of a tributary which that flows through several countries in the Himalayas and merges with the River Ganga before flowing into the ocean. Brahmapuranam: The name of one of the eighteen Puranas which describes the significance and creation of Brahma. Brahmi: The energy of Brahma personified as speech and Saraswathi. It also refers to an ancient script.